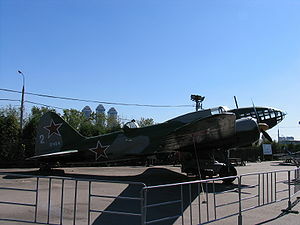 The Ilyushin Il-4 was a Soviet World War II bomber aircraft, widely used by the Soviet Air Force (VVS, Voenno-Vozdushnye Sily) although not well known. Its NATO code-name was "Bob". 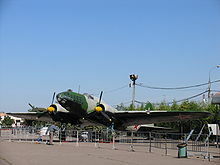 The Il-4 started life as a quickly produced bomber prototype called the TsKB-26. Parts of the fuselage and cockpit were taken from the TsKB-12 (Polikarpov I-16) fighter, married to new wings made of welded steel U-beams and tubes. Only a few were built before attention turned to the updated TsKB-30, which included a new fuselage using the same construction methods. Welding the beams required three welds per joint, so the plane took a huge amount of time to build. Nevertheless the design had excellent range and was quite sturdy. It was put into production in 1936 as the DB-3, 1,528 being completed by 1939. DB-3 was followed by the updated DB-3M, which looked similar with the exception of a much larger and more rounded nose. However the plane was actually quite different internally. Using lessons learned from the Li-2 (Douglas DC-3) the entire plane was re-built using T shaped formers instead of the tubes and U-beams. This led to a tremendous reduction in the time needed to build the plane, and the DB-3M was hurriedly put into production. A change of engine from the 708 kW (950 hp) M-87B to the 820 kW (1,100 hp) M-88 resulted in the DB-3F, which were eventually renamed in 1942 as the Il-4. Some series had wooden outer wings and front fuselage to conserve metals, and throughout the production engines and fuel tanks were upgraded for more performance while keeping the same range. However the most notable change was the addition of larger defensive guns in the turret, using the 12.7 mm (0.5 in) UBT in place of the earlier 7.62 mm (0.3 in) weapons. In addition it was found that the gunners were attacked first, so blocks of armor were placed around the gunner positions. All this extra weight wasn't offset by the newer engines however, and the Il-4 proved to be slower than the earlier versions at only 404 km/h (251 mph). An attempt to improve performance was made as the Il-6, adding large diesel engines and heavier armament. The engine proved unreliable and production was never started. The Il-4 remained in production until 1944, when just over 5,200 had been built. Although the Il-4 was only a medium bomber, it had the range to be used on strategic missions. The VVS wasn't terribly interested in this role, but nevertheless the Il-4 was used on several highly publicized raids against Berlin. Most would be used on much shorter range missions, often adding another 1,000 kg (2,204 lb) of bombs under the wings, in addition to the internal 2,500 kg (5,512 lb). Finland bought four captured DB-3Fs from German stocks. These were given the Finnish Air Force serials DF-22 to DF-25 and flown from Bryansk, Russia to Finland (one aircraft, DF-22, was destroyed en route and crashed near Syeschtschinskaya airfield). The aircraft were later flown by No. 48 Sqn during 1943 (DF-23, DF-24 and DF-25), No. 46 Sqn during 1944 (DF-23 and DF-24) and No. 45 Sqn for a short time in 1945 (DF-23), until the last remaining serviceable aircraft went into depot, February 23 1945. Up to 2,500 kg (5,500 lb) of bombs or mines. Alternatively, 1 x� 940 kg (2,072 lb) 45-36-AN or 45-36-AV torpedo. Very rarely, 2 x� BETAB-750DS 305 mm rockets. Keskinen, Kalevi; Stenman, Kari and Niska, Klaus. Suomen Ilmavoimien Historia 9, Venx�lx�iset Pommittajat (Soviet Bombers). Espoo, Finland: Tietoteos, 1982. ISBN 952-99432-7-X. Nowarra, Heinz J. and Duval, G.R. Russian Civil and Military Aircraft, 1884-1969. London: Fountain Press Ltd., 1971. ISBN 0-852-42460-4.